Defender Arcade is a significantly improved version the original Defender produced by Atari. This version is actually based on Atari's later release of Stargate, which was a far better effort than Defender. 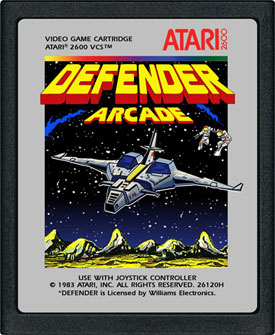 Talented homebrew author Bob DeCrescenzo made many changes to the game to bring Defender fans a 2600 version that is much truer to the arcade classic compared to Atari's initial release of the game.